(Newser) – Four teenage students were shot in the shared parking lot of two San Francisco high schools Tuesday, and one of the students is in critical condition, authorities say. A police spokesman says the shooting occurred as students were being let out of school for the day from the June Jordan School for Equity and City Arts and Technology High School, which share a campus, the AP reports. Three of the victims ran inside the June Jordan School, and police initially ordered students to stay in place until police searched each room and determined it was not an active shooter situation. 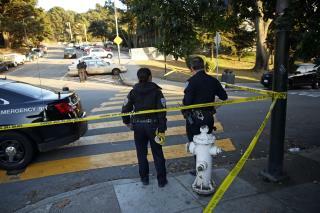 A fourth victim hurt in the shooting went to the Bayview police station. Hey California? Looks like your gun free zones and gun bans aren't working..
What? A shooting in hippy-liberal SF? . . . so typical in Chicago, another (D) city by the way. Stay classy democrats.